SA Mortgages - The 30 Year Loan .... is it the right thing to do? Given the tight economic conditions and post recession hangover, creative thinking is required to get ahead in the game. I have seen some interesting alternatives to the standard home loan being offered, one of which is the 30 year loan term. This alternative is marketed as an added benefit and is sold on the premise that it’s a good thing. Is it? Well, perhaps, in the sense that a 30-year loan can make a loan immediately more affordable, with the monthly instalment on a 30-year loan being less than the monthly on a 20-year loan granted at the same interest rate, at least in the current law interest rate environment. However, one will pay the price for this benefit in the longer term. I am under the impression that there exists a strong awareness of the “additional” interest charge that one will pay in total over the full 30 years, compared to the full 20 years on a shorter term home loan. However, very little seems to be mentioned about the “other” potential risks of extending one’s credit term. Besides the obvious impact of paying more interest over longer period, let’s look at a practical example and compare apples with apples. There are some assumptions made, one of which is the loan term is paid according to the required payment schedule, i.e. over the full 30 years, and that no additional deposits are made, bearing in mind that additional will reduce the capital and interest charges ahead of schedule. The same applies to the 20 year loan term example. In addition, I assume that both are made at 8.5% interest rate (current prime rate), and for the purpose of this example I assume that the rate remains at this level for the duration of the loans. The amount paid (capital plus interest) on a bond of R1 million over 20 years, in this example, would be a total of R2, 082,776, at a monthly required instalment of R8,678. 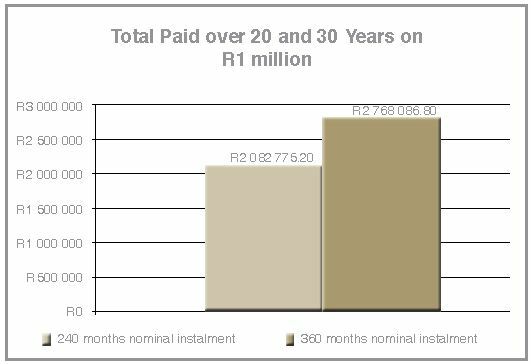 If one were to extend that same R1 million to 30 years, with the same interest rate, the required monthly instalment would be lesser R7, 689. This would imply R989/month less than in the case of the 20 year loan, but a total of R2, 768,089 would be paid over the entire 30 years, an extra R685, 312. However, some may correctly argue that we need to do the calculation in real terms, i.e. adjusting the amounts paid for inflation over time. Inflation, depending on its level, can sometimes make it attractive to repay debt as slowly as possible. That was the case in the 1980’s, when consumer price inflation was nearer to 20% and interest rates were often lower than inflation. These days, however, inflation is the repayment of debt for as long as possible less attractive. Let’s take an example. If we were to factor in a CPI inflation rate average of 6% per annum over the 20 and 30 year loan terms, still assuming an 8.5% interest rate on both loans, one would still pay an extra R78000 in real terms (i.e. total repayment over the term expressed at today’s price levels) over the extra 10 years. The differential increases as the level of interest rates relative to inflation increases. The risk – 30 year loans are a higher risk to both bank and client. However, the abovementioned comparison may have been a bit simplistic. The reality is that, all other things equal, a 30-year home loan is higher risk loan for 3 reasons. Firstly, this is due to the far slower pace at which the 30-year loan is paid down, compared to a 20 year loan, assuming the borrower sticks to the required schedule. The borrower is normally most at risk during the early stages of a loan, because that is normally where the “loan-to-home value ratio is at its highest. If the loan granted is equal 100% of the value of the home that is used as security for the loan, the home owner may battle to sell immediately without incurring a loss, should he/she suddenly experience financial difficulty (due to, perhaps, a sudden loss of employment/income), remembering that on top of the price of the house she also incurred transfer and relocation costs. In times of a weak market, this risk is increased because house prices can decline, pushing the loan-to-home value ratio to above 100%, i.e. the value of the home is then insufficient to provide full security for the home loan, a position known as “negative equity”. But as time goes by, the home owner’s risk is gradually reduced as he pays down the loan amount outstanding. In addition, there is usually some rate of house price growth over time, further contributing to a decline in the loan-to-value ratio. In the case of a 30 year home loan, the capital amount outstanding is paid down at a far lower pace than in the case of the 20 year loan. This means that the loan-to-home value ratio declines at a far slower rate than in the case of a 20 year loan, all other things equal, and therein lies the higher risk in the case of the 30 year loan for both bank and borrower. 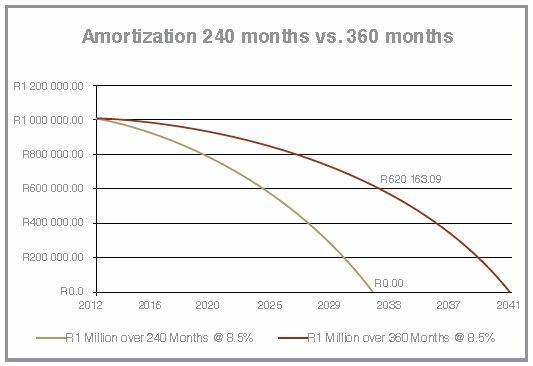 The accompanying graph, portraying what is known as the “amortization curve” illustrates the path of decline in value of the outstanding capital amounts on the 30 and 20 year R1m loans at 8.5% interest rate. One can see that after 20years, when the 20year loan amount outstanding reaches zero, there us still over R600, 000 outstanding on the 30 year loan. Let’s face it, while many of is would be tempted to take the 30 year loan option with its lower monthly repayment value, we may well regret the decision after 20 years when we realize that we haven’t even paid off half the loan amount yet. But that isn’t where it ends. There is a second cause of higher risk in the case of a 30 year home loan. This lies in the fact that in real life interest rates fluctuate. Now if one does the monthly installment calculations, you will find that the lower the interest rate the less the monthly installment value required on a 30 year loan compared to that of a 20 year loan. 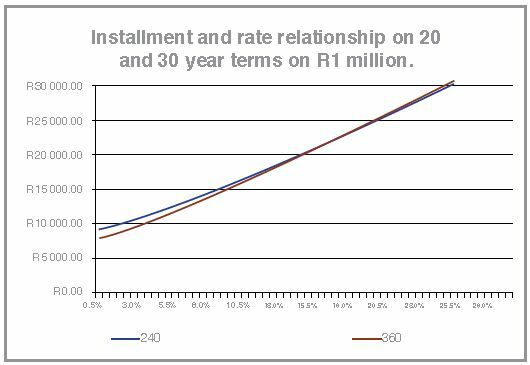 So, at the currently abnormally low interest rate by SA standards, 30 year loan installments are significantly less than the 20 year installments. However, this gap will diminish as interest rates rise (and ultimately they normally do), with the installment on a 30 year loan rising faster in value that the 20 year installments as interest rates rise. So, whereas at 8.5% interest rate, the monthly installment on a 30 year loan is R989 less than on the 20 year loan, what home loan clients are probably not being told is that should prime rate head back up to 15.5% for instance (the level of the last peak in 2008), the 30 year installment value would only be R494 less than the 20 year loan installment. Herein lies the additional risk, because when interest rates rise the household with the 30 year loan has a greater adjustment to make than the household with the 20 year loan. The above – mentioned 2 reasons as to why 30 year loans pose greater risk to bank and borrower than the 20 year loan, means that in real life the lender may charge a slightly higher interest rate on a 30 year loan than what it would have for the same applicant applying for a 20 year loan, further limiting any advantage gained from a 30 year loan than what it would have for the same applicant applying for a 20 year loan, further limiting any advantage gained from a 30 year loan. Now let’s look at the history of interest rates in SA. Over the last 20 years the average rate has been 15.97%. If we were to shorten this view and consider 10 year, 5 year and 2 year averages, we would see averages of 12,76%, 12,38% and 9,25% respectively; the result would still be well above our current 40 year low of 8,5%. 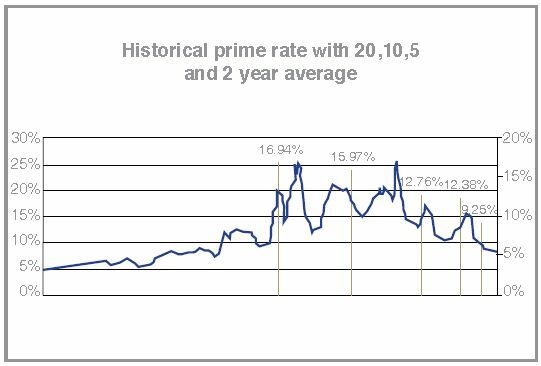 We know that prime will fluctuate over the life of the loan, and over time it is quite plausible that the average could increase again, reducing the advantage of the 30 year loan. Lastly, a risk to the borrower, perhaps not the lending institution, comes in the form of a potential negative impact on saving. If one takes on a 30 year home loan at the age of 30, one may well only finish paying it off at the age of 60, thus taking the biggest chunk of one’s productive working life. Having debt until near to retirement age can delay one’s saving for retirement, and already SA’s household sector is notorious for its extremely poor savings rate. What many households need, rather, is to get out of debt at an earlier stage of their lives and begin to accumulate savings and investments at a more rapid rate. I’m not sure 30 year loans are conductive to this. The short term benefit of a reduced repayment over a longer period seems attractive, but the capital reduction is slower, meaning your loan balance reduces at a slower rate if your term is longer. The interest afforded to the loan could carry an added premium because of higher risk on a 30 year loan compared to 20 year one. As the interest rate increases, the required installment on a 30 year loan increases faster than that on a 20 year loan, eroding the relative benefit of a 30 year loan. Larger more expensive homes can attract larger costs, e.g. Maintenance, utility and insurance costs. The rate of capital reduction on a loan over 360 months, from month one, is far slower than in the case of a 240 months. So, on a bond of R1 million, the balance after 20 years on a 30 year loan would still be around R620 000, with only around R380 000, having been repaid. Compare this to a 20 year loan whose repayment would be complete at this stage. And finally, the longer a household stays indebted, the greater the potential for its savings rate to be inadequate come retirement age. All-in-all, while there is not right or wrong regard the choice of the term of loan, clients should be under NO illusions that there are significant longer term costs and risks involved, in return for a very limited short term benefit in the form of a mildly lower installment repayment value while interest rates remain low.